The two clubs that would eventually form the present-day Fleet came into being during the early 1890s. Northfleet Invicta formed in 1890 and three years later, just down the road, Gravesend FC and Gravesend Ormonde merged to become Gravesend United. Both clubs enjoyed membership of the Southern League for a time in the late 19th century, playing against such clubs as Southampton, Tottenham Hotspur, Millwall, Swindon Town and Reading. Northfleet became Northfleet United in 1902 and with Gravesend vied for Kent League supremacy in the years leading up to the First World War. Having led a rather nomadic existence playing at grounds in Portland Meadows, the Wombwell Park Estate and Collins Meadow (the present-day Huntley Avenue), in 1904 local cement works APCM agreed to lease Northfleet a plot of land at the bottom of Stonebridge Hill. The club moved into its new ground in time for the 1905/06 season, playing the first game at Stonebridge Road on 2nd September, 1905. Northfleet were the more successful of the clubs and with Gravesend dormant from 1914 until 1932, it was the Fleet – or the Cementers as they were also called – who established themselves as the local area's primary club on the resumption of football from 1919. Northfleet won 11 Kent League titles in all, 10 Kent Senior Cups, five Kent League Cups, four Kent Senior Shields plus honours in the West Kent League, Thames & Medway Combination and Kent Junior Cup. During the 1920s, the Fleet won five Kent Senior Cups in succession and dominated the Kent League in the 1930s. This was in no small way down to the link the club established with Tottenham Hotspur from the early 1920s. It was a relationship that developed increasingly through the late Twenties, with Spurs sending some of their brightest young players down to Stonebridge Road, establishing Northfleet as their nursery club. Just some of the illustrious names to have played in Fleet red included Arthur Rowe, Taffy O'Callaghan, Ted Ditchburn, Bill Nicholson, Ron Burgess, Freddie Cox and Les Bennett. Tottenham's first side following the Second World War contained 10 players who had come through their Northfleet nursery and these players formed the backbone of the Spurs side that won the First Division title in 1950/51. Gravesend, meanwhile, had resumed playing in 1932 at the lower level of the Kent Amateur League and never quite reached their previous heights of the late 19th and early 20th centuries, playing home games at a new ground in Central Avenue. Northfleet's benefactor Joe Lingham – who had helped found the club as a player in 1890 and went on to become chairman and president – died in 1943 and after the Second World War, the club had little but its Stonebridge Road ground to show for 56 years of existence. Gravesend were in rather better shape, with an active board of directors, and these men led a plan to merge the clubs. Gravesend's directors were the prime movers in getting together a club for Southern League action in 1946/47. Northfleet provided Stonebridge Road as a base and the newly created entity, Gravesend & Northfleet FC, adopted the red and white colours and nickname of the Fleet, officially coming into being in April 1946. The newly merged Gravesend & Northfleet FC formed in April 1946, moving into Northfleet’s superior facilities at their Stonebridge Road ground, with most of the directors coming from Gravesend United. The Fleet played their first ever game on 31st August 1946, against Hereford United, and ran out 3-0 winners in front of more than 5,000 fans. Their manager for the first season in the Southern League was Andy Wilson, a Scottish international who had played for Chelsea and Middlesbrough, and he swiftly assembled a capable side which finished sixth in its first campaign. Despite lofty ambitions (the Fleet were the first side in Kent to install floodlights, in 1953) and full-time investment, the Fleet teams of the Forties and early Fifties yielded only two Kent Senior Cups and it was not until Lionel Smith's appointment as manager in 1955, that the club began to reach its potential. Smith, a former England international who had won the FA Cup with Arsenal, drafted in teammate Jimmy Logie from the Gunners in what was a massive coup for the Fleet at the time. Logie, together with players such as Eric Day, Jimmy Scarth and Bob Thomas helped the Fleet lift the Southern League title in 1957/58, the star-studded and attacking side scoring 135 league and cup goals along the way. They were runners-up the following season, also lifting the Southern League Championship Cup, and crowds of 3,000–5,000 regularly flocked to Stonebridge Road. The ageing side's influence began to wane, however, and after a 17th place in 1959/60, Smith called it a day and with the end of his management tenure, so ended the Fleet's first and perhaps most successful era until the 21st century. The optimism of the 1940s and relative success of the 1950s did not last, and financial concerns meant that the Sixties were a torrid time for Fleet fans. The break-up of the ageing Southern League title-winning side and departure of manager Lionel Smith in 1960 spelled the beginning of the end for the club's Football League dreams, even though the Fleet twice applied for membership of 'The 92' in the early Sixties. Nevertheless, during this period the club enjoyed its best ever FA Cup run in 1962/63 when the Fleet reached a Fourth Round replay at Sunderland after a 1-1 draw at Stonebridge Road in front of a record attendance 12,032, also setting an existing record of five months as the longest cup run of any team in the long history of the competition. However, that season also coincided with the club's first ever relegation – to the Southern League Division One – and crowds dropped sharply, dwindling from the thousands to the hundreds in the space of a few seasons. Things got even worse after that relegation, with the club finishing in the bottom three of the league six times in seven years up to 1969. In 1967, the entire Board resigned en masse, leaving the club with nothing but a ground and considerable debts and five different managers tried and failed to stem the rock-bottom decline in a two-year period. The appointment of Alf Ackerman in 1968 finally brought some stability to the Fleet ship and he engineered a slow but steady revival that brought much better prospects for the 1970s. Alf Ackerman finally hauled the club out of the doldrums in 1970/71, a third-place finish earning the Fleet (who counted future England supremo Roy Hodgson among the team) their first promotion – and it was back to the Premier Division of the Southern League. It was a short-lived stay, however, that lasted just one season, with Fleet conceding 110 goals and finishing bottom of the pile in 1971/72. Ackerman resigned in 1974 and things picked up after Tony Sitford’s appointment as manager in Ackerman's wake, and the Fleet duly won the Southern Division title in 1974/75. Despite a hoped-for Premier Division title challenge over the next few years, consolidation instead followed. A brief title challenge was mounted in 1976-77, but the Fleet did take home the Southern League Cup that season, following victory over Weymouth in the final. Under go-ahead chairman Roger Easterby, Fleet’s decent showing over the next two season meant they qualified as founder members of the newly created Alliance Premier League (later Conference) in 1979/80. Easterby resurrected the dreams of Football League membership and with one of the most talented squads seen at Stonebridge Road, the Fleet finished an excellent fifth in the APL's inaugural season. Players such as Lee Smelt, Steve Brown, Kenny Burrett, Geoff Idle, George Jacks and Phil Stonebridge became club legends in that era and the club also boasted an attractive friendly against European champions Nottingham Forest in 1980 to open new floodlights, some 6,000 people cramming into Stonebridge Road for the occasion. As the Eighties dawned, the club seemed to be in better shape than ever, but it wasn't to last. The Eighties spelled more hard times for the club and despite a healthy showing in the first APL season, the cost of football at that level and an impending financial crisis saw the storm clouds gather behind the scenes. Sitford departed the manager's job in 1980 and a last-day defeat meant relegation back to the Southern League in 1982. Managers Tony Burns and Eddie Presland tried to keep the club afloat in choppy financial waters and Burns handed over the reins to Presland as a disastrous second relegation in 1985/86, to the Southern League Southern Division, came to pass. Fleet were well and truly back in the doldrums of non-league football and recorded their lowest ever average crowd in 1986/87. Having almost gone to the wall as financial problems beleaguered the club following that season, a group of supporters stepped up to the plate as directors under new chairman Lionel Ball. This ultimately rescued the Fleet from closure and the new board, under manager Denis Moore, was rewarded with a promotion back to the Premier Division in 1988/89 and a best-ever FA Trophy run, with two major Conference scalps claimed along the way. Once again, promotion wasn't built on and the early Nineties were a struggle for the club. The high-profile appointment of former Enfield manager Eddie McCluskey had a reverse effect than intended as he reshaped the squad but only escaped relegation in 1990/91 due to other clubs' ground problems. The following season was even worse, with 8-1 and 9-0 defeats coupled with the club missing out on a money-spinning FA Cup tie at Peterborough by losing to lower-league Harlow Town. New boss Garry Aldous couldn't arrest the decline and the club was relegated in 1992. Aldous, however, built a fine side thereafter, recruiting legendary striker Steve Portway who scored 64 goals in his first season. It wasn't enough to stop the Fleet's title charge from crumbling in the final few weeks of the season but there was no mistake in 1993/94, Portway firing 52 more goals as the club lifted the Southern Division title. Season 1995/96, under caretaker manager Chris Weller, saw long overdue FA Cup success a 10-game run and victory over Colchester United leading to a Third Round tie at Villa Park. There the Fleet stood up well to Aston Villa's star-studded side and they were unfortunate to lose 3-0 in front of a 26,000 crowd that included more than 7,000 followers from Kent. The late Nineties were largely unremarkable, with crowds once more nose-diving. Former Welsh international Steve Lovell's tenure as player manager lasted only a season and youth manager Andy Ford took over the helm in 1997. This coincided with Fleet ending their long association with the Southern League, transferring to the Ryman/Isthmian League in 1997 that same year. Ford built a side slowly but surely and by the early years of the 21s century, Fleet had earned a top-six spot in the Ryman Premier but the dream of Conference football still seemed some way off. Unfancied Fleet came from pretty much nowhere to land the Ryman League Championship in 2001/02, following a nervous and titanic struggle with Canvey Island, which saw the two meet at Stonebridge Road in April 2002 in front of an official 4,068 (but probably more like 6,000) fans. Jimmy Jackson lifted the Ryman shield at Bedford Town, a fitting moment for a player who would become the club's record appearance holder a few years later. Ford's side also ran Huddersfield Town close on their own patch in the FA Cup, before succumbing to an injury-time winner. Back in the top-flight of non-league football, the Fleet had a few narrow brushes with relegation, with Ford – then the longest-serving manager in the club's history – stepping down in January 2005. New manager Liam Daish (who would eventually take over the mantle of longest-serving boss from Ford) oversaw a move to full-time football and made slow but steady progress with the capture of signings like striker Charlie MacDonald. 2007 was the year it all changed for the Fleet. First, in May 2007, 61 years after the formation of Gravesend & Northfleet, the club announced a change of name to Ebbsfleet United to take advantage of the massive regeneration of their locality. Then in November 2007, it was announced that the club was to be taken over by internet venture MyFootballClub.co.uk, a revolutionary idea involving paid members owning the club, voting on decisions and picking the team, a deal that was ratified in February 2008. 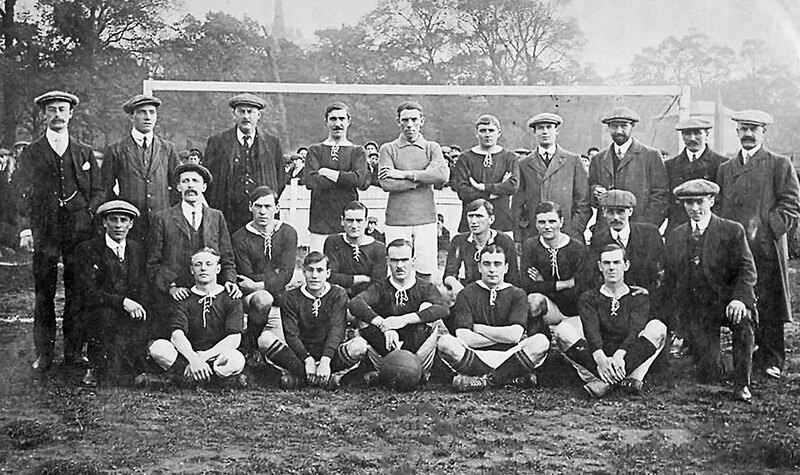 On the footballing side of things, the Fleet enjoyed their most memorable moment in more than six decades, clinching victory in the FA Trophy Final at Wembley Stadium, a 1-0 win over Torquay United in front of 40,186 (28,000 from Kent and/or the MyFC membership) proving enough to take home the silverware. With hopes high for 2008/09 and the club’s then highest-ever playing budget voted on by MyFC members, the eventual league position of 14th and flirtation with relegation was disappointing. Defence of the FA Trophy fell just short of another trip to Wembley, the Fleet edged out by Stevenage at the semi-final stage. With the fall in MyFC membership in February 2009, Fleet faced an uncertain future, releasing almost their entire first-team squad. Daish remained as manager and rebuilt a squad that almost, heroically, defied the odds but fell to relegation on the final day of the 2009/10 season. The manager was forced to rebuild again in 2010/11 as the club embarked on its first season at a lower level in nearly a decade and once more the manager proved his talent for assembling a squad as Fleet unexpectedly won promotion back to the Premier Division at the first attempt. It came courtesy of a third-place finish in the league and a 4-2 win at Farnborough in the play-off final to cap a truly memorable season that also saw the club progress to the First Round (and get within 30 seconds of winning through to the Second Round) of the FA Cup. Returning to the Conference for the 2011/12 season, the club finished a creditable 14th in their first season back in non-league’s top flight. The following season, however – despite much initial optimism – saw the Fleet struggle to compete and a relegation that looked inevitable from early on was confirmed in April 2013, Fleet finishing second bottom of the division, a long way adrift of safety. Off-field matters dominated, with several appeals for investment throughout the season until fans were faced with the very real threat of the club closing or taking voluntary demotion down the non-league Pyramid. As the season ended, the club faced the prospect of going to the wall, perhaps as close to extinction as at any time in the past. In May 2013, a purchase proposal from Kuwaiti company, KEH Sports Ltd, was accepted by MyFC and the the club pulled back from the brink of closure. KEH – under benefactor Dr Abdulla Al-Humaidi and with former Charlton CEO Peter Varney as vice chair – began an immediate ground restoration programme, with the long overdue replacement of two roofs at Stonebridge Road and refurbishment of the entire stadium. Ex-Charlton defender Steve Brown replaced Liam Daish, his record-breaking eight-year term ended by mutual consent, with ex-Charlton manager Steve Gritt as assistant, while KEH promised a competitive transfer budget. Fleet were just pipped to promotion by Dover Athletic, losing the promotion final 1-0. With promotion a target for the next season, 2014/15 didn’t go quite so well and Brown was relieved of his duties in November 2014 to be replaced by former Welling United boss Jamie Day. His considerable shake-up of the squad in mid-season didn’t quite produce the desired effect and although Fleet reached the quarter-finals of the FA Trophy, they dropped away badly in the league, Day paying the price after only five months in the job. Former club skipper Daryl McMahon was handed the manager’s reins in time for the 2015/16 season with Fleet once more determined to go all-out for a place in the National League.Ten wins from the opening 11 games put Fleet in prime position for the title but a record-breaking run by Sutton United clinched first spot from us. Just 22 seconds from promotion in the subsequent play-off final v Maidstone United, Fleet were pegged back in the last minute and lost the promotion decider on penalties. McMahon made no mistake the following season and though Fleet began 2016/17 slowly, a club-record winning streak in 2017 saw the side finish second once more, Maidenhead United pipping the Fleet to the title by two points. Ten-man Fleet came from behind to win the promotion final against Chelmsford and were back in the National League after a four-year gap. That season also saw the opening of the new £5m Main Stand, which replaced the Stonebridge Road stand that had stood from 1959 until it was demolished in 2016. That first season back was a superb one. Fleet went 32 games unbeaten in the calendar year of 2017 and though they had a wobble midway through the 2017/18 campaign, another fine run saw only one defeat in 14 games to clinch a sixth-place finish and a first-ever play-off spot at the top level. Fleet came back from the dead twice in a nail-biting penalties victory over Aldershot Town and came to within one game of Wembley... but the play-off semi-final at Tranmere was just a step too far, as Rovers won 4-2 after extra-time against an exhausted, depleted Fleet.